RECENTLY, Singapore became the third nation to ratify the Comprehensive and Progressive Trans-Pacific Partnership (CPTPP) after Mexico and Japan. Malaysia’s future in the agreement, however, continues to hang in the balance. Malaysia’s participation in CPTPP is a hot-button issue. It cuts across all pillars of national interests, but missed the firing squad in the run-up to the May 9 general election. Now that the dust has settled, what better time than now to restart the discussion on this controversial topic? 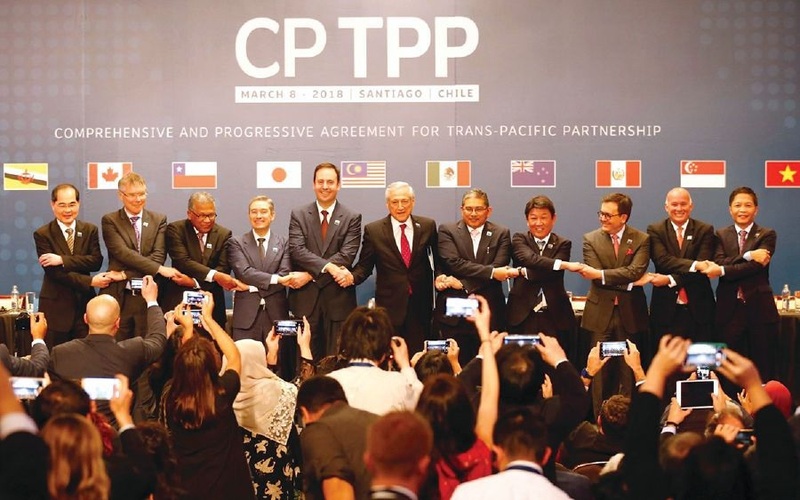 Judging from the manifesto by both coalitions, it seems rather “awkward” for the previous administration to follow through with the ratification of CPTPP. On the one hand, Barisan Nasional (BN) propagated continuity, in particular with respect to leadership, affirmative policy and governance. Pakatan Harapan (PH ) , on the o t her h and, promised continuous reform agenda with progressive and democratic development ideas. This author argues that CPTPP is more in line with PH’s philosophy as the agreement represents a wholesale of policy changes that go deep into existing policies. Let’s start with the Buku Harapan. Janji #23, for example, highlights PH’s intention to review government procurement and tender procurement practices. This is in line with CPTPP’s procurement disciplines and threshold for goods and services that will essentially disrupt the status quo of present participants. It also encourages a more equitable and efficient allocation of preferences. More importantly, strict transparency rules will limit the window for corruption as all information relating to “covered procurement” are required to be publicly accessible. In fact, Malaysia may even graduate from the observer status in the WTO’s Government Procurement Agreement to become a full member following the ratification of CPTPP. Presently, there is no specific law to govern state-owned enterprises (SOEs) in Malaysia. Despite the recent brouhaha on key appointments at Khazanah Nasional, political interference in the day-today administration of SOEs can be minimal. CPTPP will ensure that SOEs conform to stringent trade disciplines in the domestic and in members’ markets. Malaysia will need to introduce an act to harmonise governance and transparency requirements of SOEs that is in consonance with international standards, and as enshrined under Janji #22 of the Buku Harapan. CPTPP promises high-quality labour rights that is based on the four principles outlined in the International Labour Organisation Declaration 1998. Janji #35 of the Buku Harapan promulgates the strengthening of workers rights and providing more freedom for workers to demand for their basic rights, mirroring much of CPTPP’s labour disciplines. This will ensure that the benefits of trade leads to a higher real wage growth in addressing today’s rising cost of living. Speaking of which, Janji #2 of the Buku Harapan promises lower prices of daily necessities. Once Malaysia ratifies CPTPP, almost 85 per cent of goods will face zero import tariffs following the agreement’s entry into force on many essential food items, such as flour, fish, meat of bovine animals, vegetables and sugar. All of these promises point towards one direction: good governance. It goes without saying that CPTPP and the Buku Harapan go hand in hand in promoting policy clarity and predictability while strengthening coordination among government agencies in reducing duplication and redundancy. Issues such as open tender and dissemination of approved permits for motor vehicles, for example, are required to be fully accessible by the public. Suffice to say, there is enough internal pressure on the present administration to proceed with ratification knowing that the opposition will demand PH to honour many, if not all, of its election promises. Furthermore, it is in PH’s interest to push its limits for reforms by ticking as many boxes as they possibly can in order to present themselves as a credible alternative to BN. In the event that PH fails to fully deliver its 100-day pledge, this could be the next best thing. If internal pressure is not enough, the political and economic dynamics surrounding world trade will push Malaysia to thoroughly consider ratifying the agreement. That said, it is equally important to consider Malaysia’s future in the CPTPP from the external perspective as well. As it stands, Vietnam is happily cruising to become “the first six”, thus harnessing its first mover advantage ahead of Malaysia. Once the National Assembly passes all necessary papers, which is highly probable, Vietnam is in a much comfortable position to take advantage of the on-going trade war between the United States and China. Although both countries are not members of the CPTPP, investor confidence will surely move in Vietnam’s favour. As a result, trade and investment diversion prospects due to CPTPP are not theoretical after all. As a fully ratified member of CPTPP, Vietnam will have exclusive rights to discuss accession process with aspirant economies of great economic interest to Malaysia, namely South Korea and Britain. Malaysia will be on the outside looking in, with envy. The prospect of Thailand and Indonesia joining the pact will only raise the temperature higher, not lower. It took our negotiators blood, sweat and tears (not literally) to reach to this point. Let us not let it go to waste.